Scruffy was with me since he was 9 weeks old, in the spring of 1980. He was my first dog and taught me so much about the joy of dogs and about how to live my own life more peacefully. I always joked that he was a cross between Buddha and Yoda - a small black poodle who grew gray as he aged, with soft wise eyes that looked right into you even after he began to lose his vision. He was the one who accompanied me through tears, quiet times, and all sorts of silly games. He abhorred tears, doing his best to lick them away, and he never met a human that he didn't get to like him, including people who didn't like small dogs or even dogs at all. Scruffy ended his long life just as he lived the rest of it: He chose his time and gave me a couple of weeks after having a huge seizure to let me know he was going soon. And then he left us quickly and peacefully. He was happy and comfortable until the day when he woke up unable to stand on any of his legs and rapidly became weaker. The next morning, a couple of hours before we went to the vet, he shared part of my breakfast (a few tiny morsels of a bagel and cream cheese), our lifelong morning ritual, and he let me rub his tired body softly. And when it was obvious that he needed help to leave, he lay peacefully and was gone almost instantly, with his loving humans stroking him and talking to him. Scruffy was 17 when we lost him, and will always be my Dog of Dogs. My beloved Billy (Billy Peanut, Billy Timex, Billy Goat) joined our pack in the fall of 1980 when he too was only 9 weeks old. He was a spry little apricot miniature poodle who filled our home with his gentleness, his stubbornness, and his clownish personality that made him an eternal puppy, even when he couldn't climb a flight of stairs on his own any more. Never have I met or will I meet again I am sure, a dog who was so gentle and so goofy that you absolutely could not stay sad when you were with him. Billy was plagued through his later years with megaesophagus, which made him a skinny little fellow who had to be on a special diet for several years. But he never lost his silly puppy ways, and he bounced back over and over again, always with a look that said, "Well of course I did!" He would dance on his rickety back legs and bark a huge bark (he was a bit deaf by then) whenever I offered him a treat. 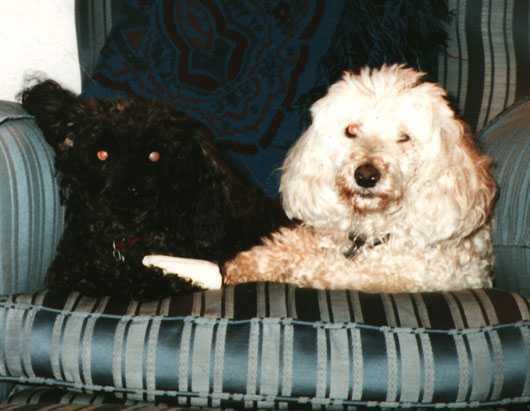 He and Scruffy were inseparable, even after we brought Callie, already the Earth Mother Poodle at 1-1/2 years old, into our home. She gently herded her two old fellows around for over three years. Two weeks after we lost Scruffy, Billy woke in the night wailing like a lost puppy. The next morning he too could not stand up. I held him all morning and he cuddled against me with his eyes closed, occasionally raising his head and rubbing it against my chin. Our vet saw him later in the morning and told us that Billy was shutting down all of his systems. We had to make the awful decision to help him cross the Rainbow Bridge, two weeks to the day and hour and in the same room where his beloved Scruffy left. I think that Billy was like a swan who picks a mate for life and just didn't want to go on without his beloved friend. Did it hurt a lot to lose them this way after all of those years? You bet. S&B had lived with me through the worst times of my lives and then the best. I cried uncontrollably at a moment's notice for weeks, and still do sometimes, several months later. Fortunately I had many wonderful friends who understood the depth of my loss and helped me through. Even our third dog Callie was miserable. She had cared for the old boys as if they were two odd puppies. A few days after they were both gone, she ran around their favorite couch, barking at them to come outside and play, and then she walked away looking as dejected as could be. Another day she found the sweatshirt I had worn both days when we took the fellows for their last trips to the vet, lying on a hamper since I could not bring myself to wash it (I still haven't - It is now in a closet safely wrapped up). She sniffed at it gently, licked it softly several times, and then walked over and sat next to me quietly. Whoever thinks that dogs don't feel true grief and want to console and be consoled is nuts. In some ways it is easier to think of Scruffy and Billy together and happy as they always had been. And I would not have given up those later years with them for anything, painful as it was to lose them.